Ever wondered what’s it like to work at Syntelli? Read below to learn about one of our intern’s experience this past summer! Over the past few weeks, I have been interning at Syntelli Solutions. To be honest, I didn’t know what to expect on the first day. I walked in to the office not knowing anyone, what I was going to be doing, or even what exactly data analytics was besides literally analyzing data in some shape or form. To my pleasant surprise, it was something I truly enjoyed and something I learned a lot from. And as I sit at my desk typing my final blog post on one of my last days here, I realize how invaluable the practice of data analytics is in today’s data and information driven world. Flashback to my first few days and I was in the conference room learning the basics of the R statistical programming language and how it’s utilized in Spotfire as TERR (TIBCO Enterprise Runtime for R), from Mario Carloni, one of the data scientists at Syntelli. At first, it was quite confusing, but I tried my best to understand it until I installed the Spotfire and R Studio softwares on my computer, and was able to try everything out for myself. This is when it all clicked and I was actually doing real data analytics work on my own. Our first analysis was using the US Census API and created data visualizations to determine patterns and differences among all the US states. When the map of the US was made and it showed various statistics for each state, it was pretty amazing to see what I had done and made me ponder about the potential of the insights I could gain from the data. However, an even better surprise project was waiting to be assigned to me the next day. As I continued to research different functionalities in R and Spotfire, Shikha Kashyap, the VP of technology at Syntelli, walked into the room where my co-intern and I were sitting and assigned us our new project. We were going to use the Twitter REST API to analyze tweets and figure out what types of information we could extract from it. Coincidentally, our internship took place during one of the world’s most hyped and grandiose events, the FIFA World Cup. So we set to work researching how to work the Twitter API. After having researched it, we typed in the command to extract all Tweets pertaining to #WorldCup during the last 60 seconds and watched as the tweets formulated a data table with all of the various information associated with each tweet. Amazed at the information available to us, we then converted the data tables into files that could be read by Tableau, another data visualization software. Using this software, we were able to organize the data and create visualizations based on retweet count per nation and per language and various other situations. I am truly amazed about the information available for our expansive yet interconnected world. As if this wasn’t thought-provoking enough, we were then given the task of figuring out how to live-stream the tweets and perform sentiment analysis on the tweets from the Netherlands vs. Brazil game to see how fans reacted to the game in real-time. Hence began the research on how the streamTwitter function worked and the commands for how to extract different types of information and how to assign a sentiment score to each tweet. We had to find positive and negative dictionaries with assigned sentiment scores and match them to the tweets to assign the scores themselves, in R of course. After having created the file constituting of all this information, we then imported the data into Tableau and Spotfire and created visualizations showing how each respective country reacted to the game. Seeing this visualization truly made me wonder about the possibilities with this sort of data in different applications. What if this was used by companies to determine whether or not their business practices were being perceived positively or negatively in various countries? Many products and services could then be improved and tailored for that particular environment. This would allow for consumers to have products and services that better suit their needs which ultimately would generate more revenue for the company. After discussing our findings with Rishi Bhatnagar, the company’s CEO, we realized not only the potential for data analytics to transform companies but his vision for Syntelli as well. Data analytics is truly essential for companies to perform. It is imperative to understand how customers and businesses can interact in today’s hi-tech world. As I transition to my first year of college at the University of North Carolina at Chapel Hill, I may even further involve myself with data analytics – maybe some research, classes, or other work. This was all thanks to my internship at Syntelli. I have learned that such companies or divisions are imperative to business practices. The work that Syntelli does is forward-thinking and indispensable. If I ever need more advice on data analytics in the future, I know where to go. 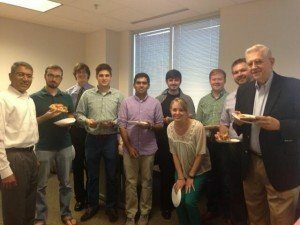 Syntelli Team & Interns during a pizza party.